The City Zoo's gazelle habitat, in 3013. [7ACV17] Present are Zoidberg, Bender, Amy, and Guenter. The City Zoo is a zoo on the planet of the primates. 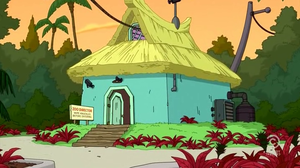 In 3013, Guenter took Bender, Zoidberg, and Amy there, where they discovered that Fry and Leela, who thought that they were on a romantic holiday, were secretly caged up in a human habitat. The four then went to talk to the zoo director — Dr Banjo. A week later, Fry and Leela were taken home on their automated shuttle. Casa Isolada Eco Resort is the front for the zoo's human habitat. It has a pool and a bar. It uses pairs of robot hands as employees. Humans have been vacationing in the habitat for years. Leela was previously there with her old boyfriend Sean. 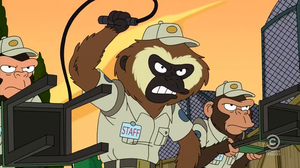 When Sean returned to the resort, with his wife — Darlene —, the zoo quickly invited Leela back, as a behavioural experiment, keeping Sean and Darlene there under the pretext of shuttle repairs. The human exhibit had never been so popular, and the zoo even went as far as selling Fry wigs. "Casa isolada" is Portuguese for "isolated house". Guenter: Unlike your Earth zoos, our zoo is a model of compassionate encagement. The animals don't even know they're in captivity. [Four gazelles run into an invisible wall.] See? ^ Countdown to Futurama: Dr. Banjo Returns. (Comedy Central's Tumblr page.) 04 May 2013. Retrieved on 05 October 2013. ^ Countdown to Futurama: I Want My Dollar. (Comedy Central's Tumblr page.) 18 June 2013. Retrieved on 05 October 2013. ^ Jennings Brown (08 May 2013). "Producer David X. Cohen on Futurama's Final Final Season". Popular Mechanics. Retrieved on 05 October 2013. This page was last edited on 6 October 2013, at 05:22.